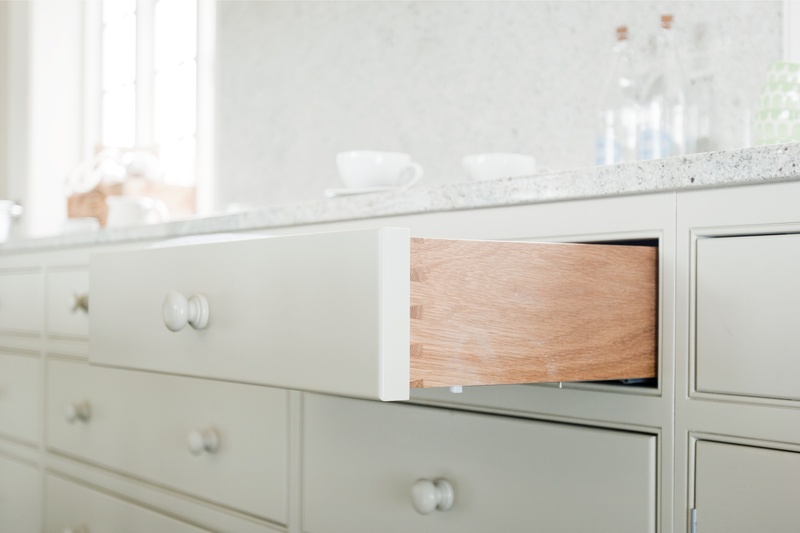 It can be the small, simple details of your kitchen design – tailored to the way that you and your family use the space – that make your bespoke Griggs & Mackay kitchen a joy to use. Every project we undertake is unique. Nothing we do is ever reproduced. 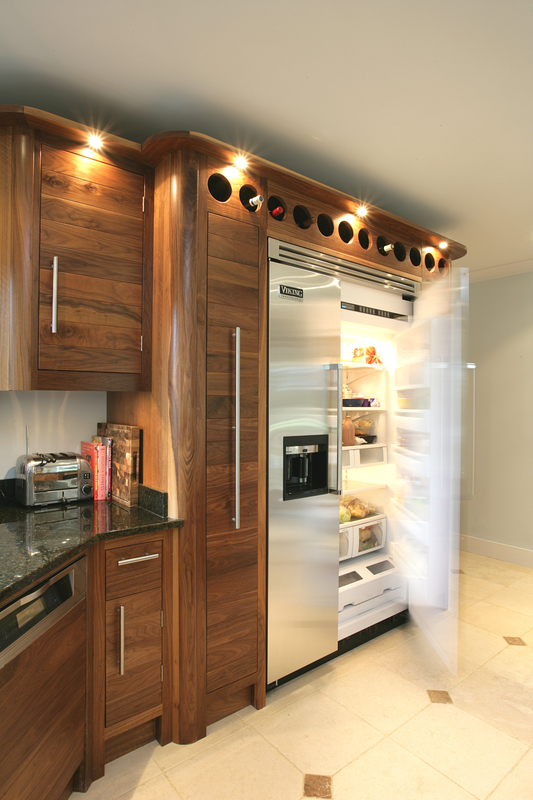 It’s a truly bespoke service – tailored to the exact dimensions of your kitchen, tailored to the exact dimensions of your wishes. 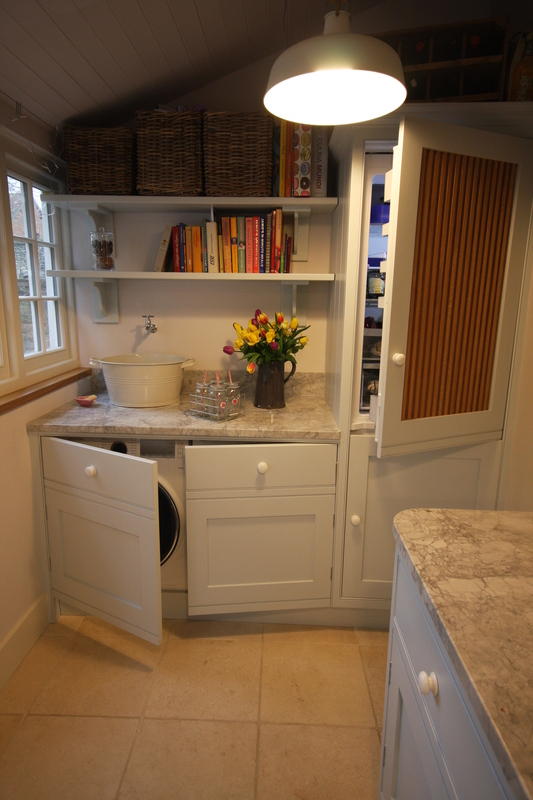 From handmade cabinetry and ergonomic islands, to cleverly hidden storage and carefully chosen colour palettes – you’ll find a variety of our most recent projects in this gallery to inspire you! 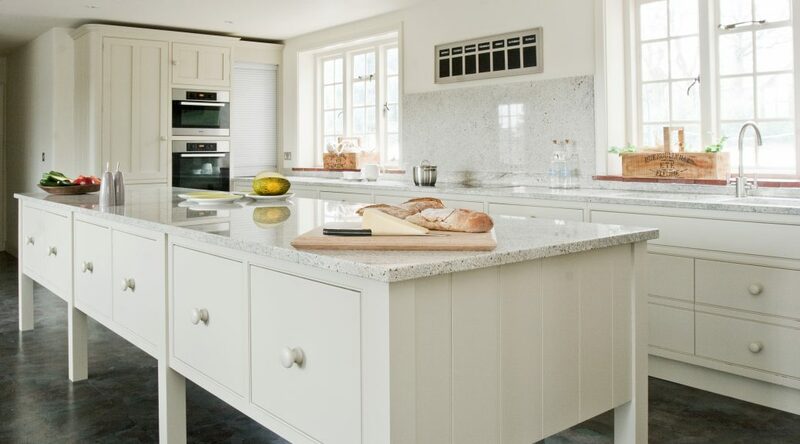 This bright and airy country kitchen was hand-painted in Farrow & Ball’s ‘Strong White’ throughout, paired with stunning, speckled granite worktops. 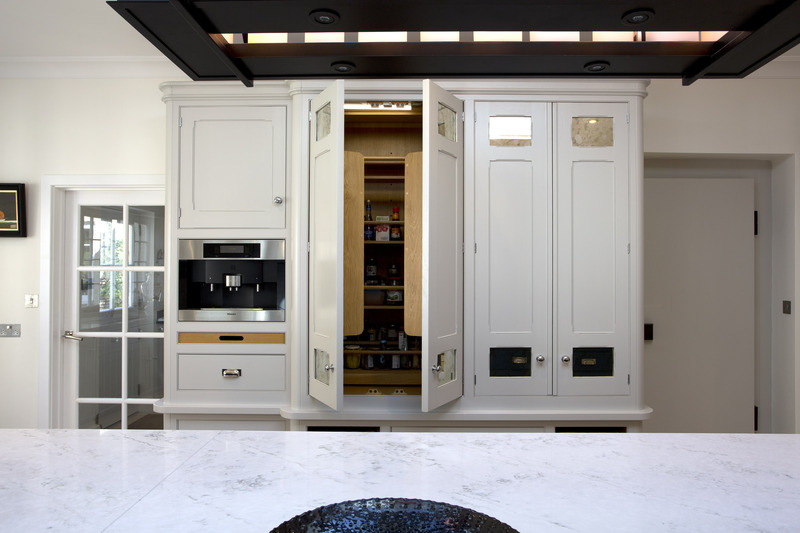 In the centre of the space is a large, single-level island that stretches generously across the kitchen with plenty of integrated storage. An ingenious glass partition window further opens up the space, drawing light into the room and increasing a sense of flow and connectivity. 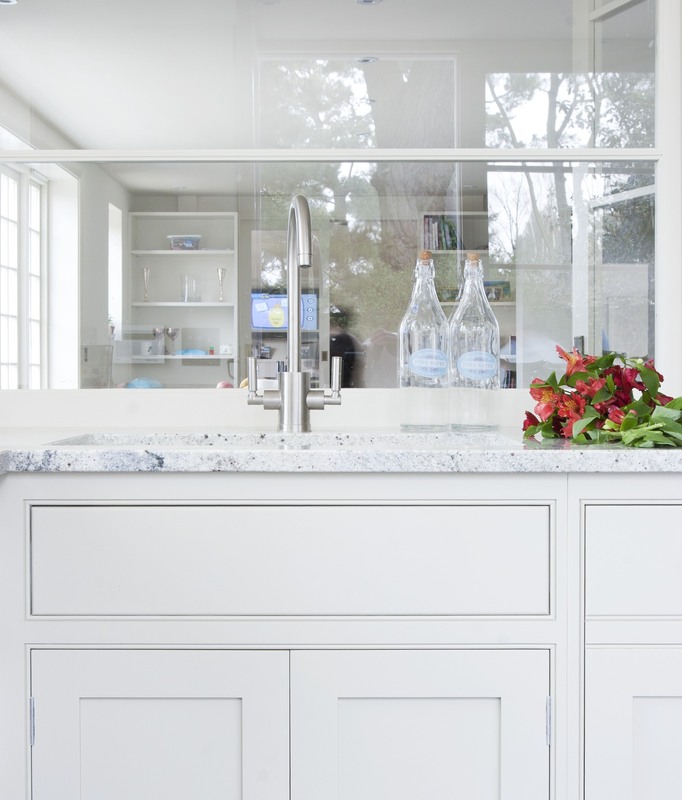 This cosy, galley kitchen in Abingdon has taken on a New England Country-style, incorporating both traditional wood and light-reflecting, Carrara marble worktops. 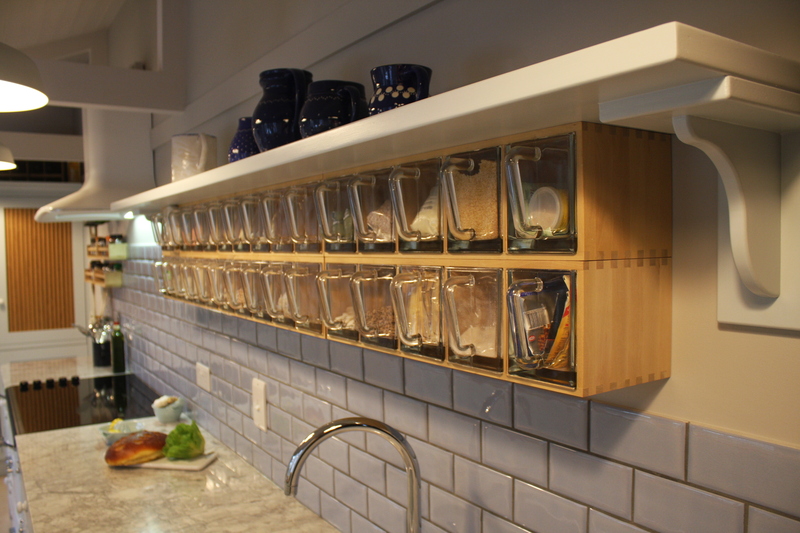 Hand-made, floating wooden storage compartments offer a unique yet practical solution in this compact space. 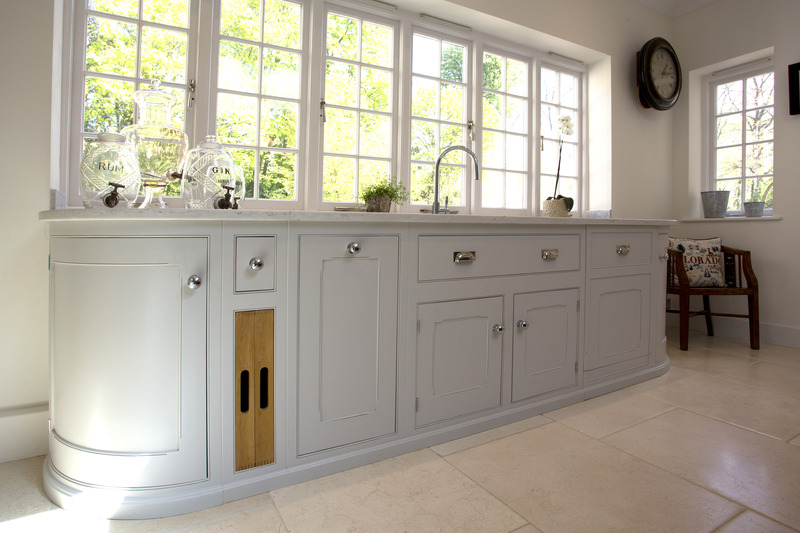 Lovingly-crafted, bespoke units are hand-painted in Farrow and Ball’s ‘Great White’, with its lilac tones complementing soft-purple, glossy metro tiles. A neutral palette with the warm tones of wood is the perfect solution for creating a homely, more inviting space. 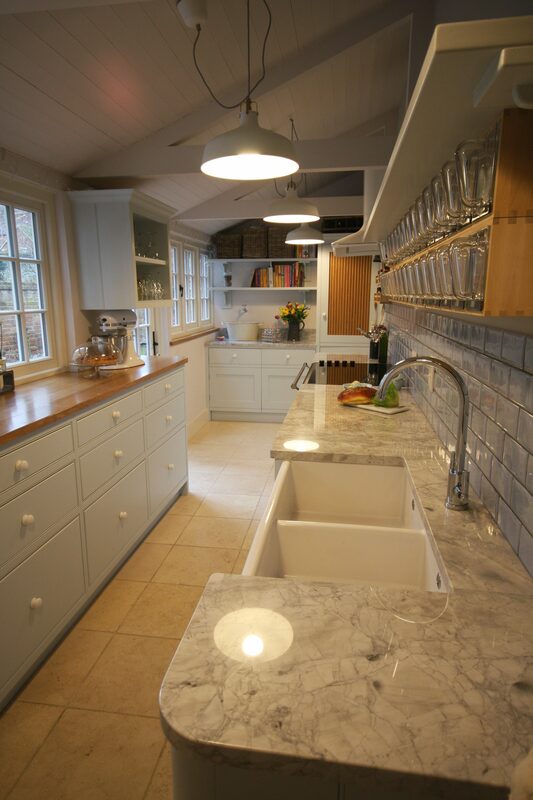 Not only do they work well in smaller-sized kitchens, but transfer beautifully to an open-plan living space too. 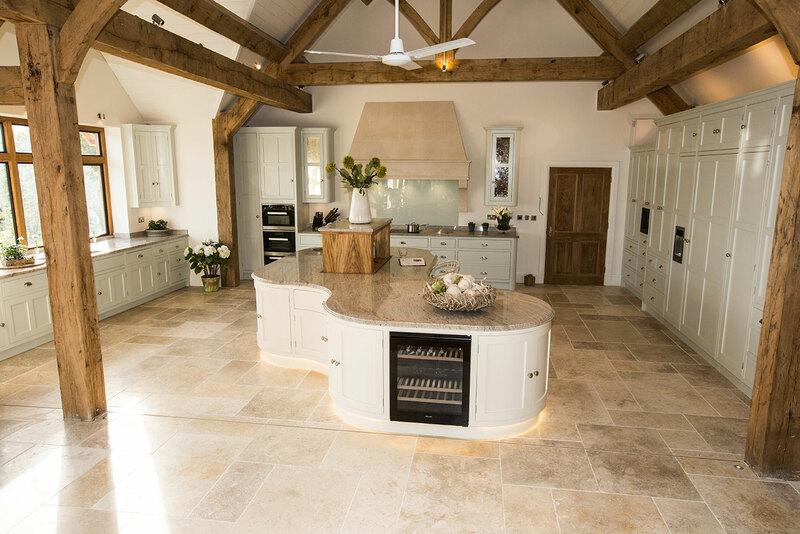 This stunning kitchen project was given a relaxed, yet sophisticated feel – brought together by classic, cream painted cabinetry, beige-toned marble worktops and earthy stone floor tiles. 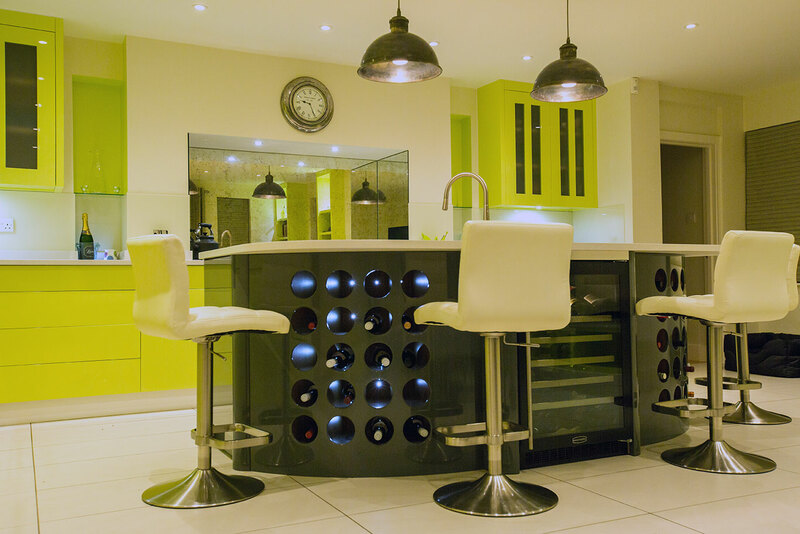 Be inspired by this fabulously daring kitchen colour scheme! 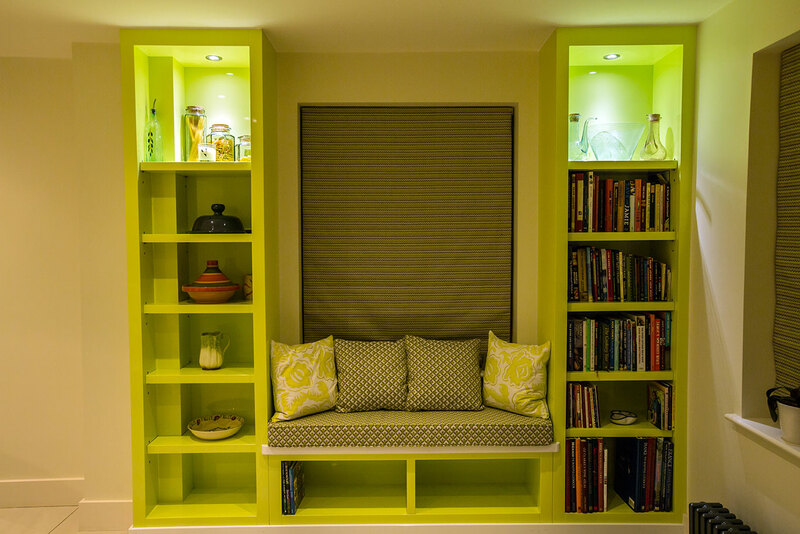 Our client chose a classic cabinet style and updated it with a vibrant, punchy lime green. 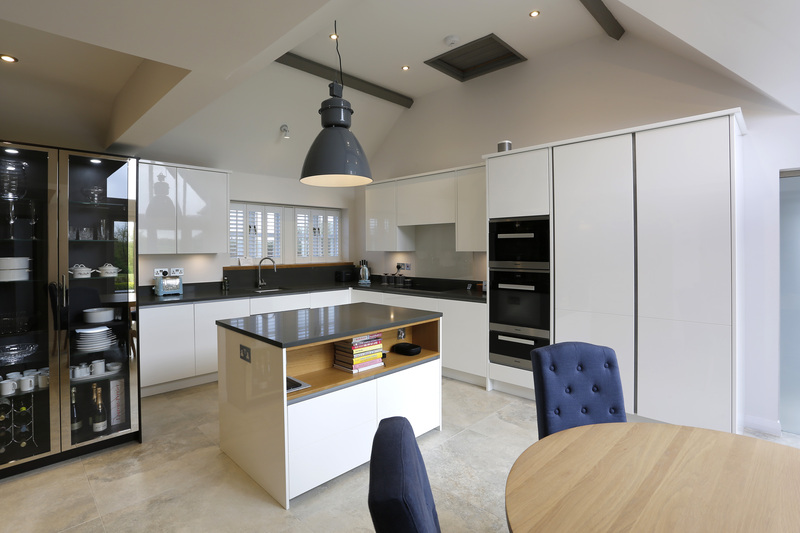 To counterbalance, we incorporated monochrome elements – such as white quartz counter-tops, matte ceramic floor tiles and a modern, jet-black kitchen island installed with LED lighting and multiple storage options. 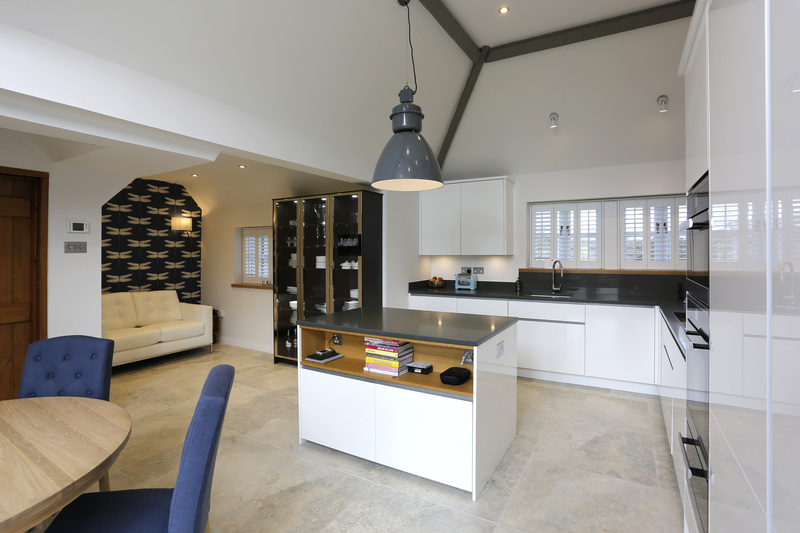 This contemporary kitchen design has brought a minimalist elegance to our client’s stunning country home. 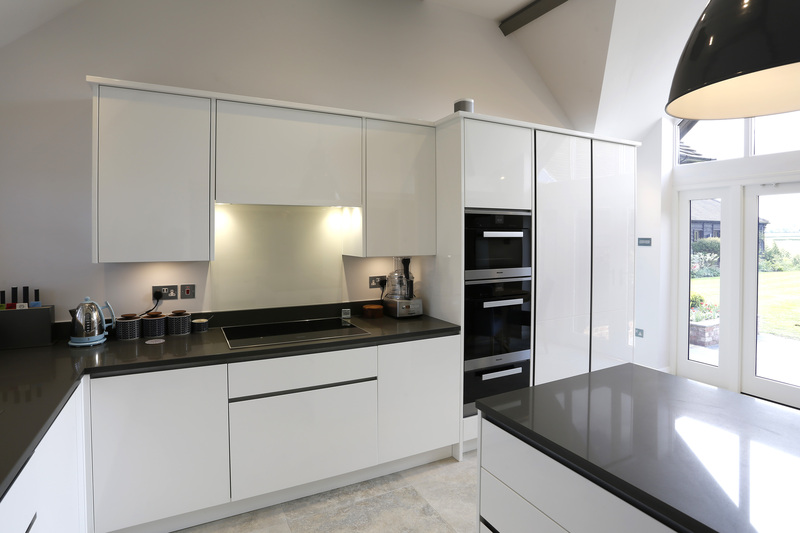 Smooth white cabinets and smokey granite worktops make for a sleek, modern feel. Brought together by charcoal-painted original beams, an industrial-style pendant light and touches of natural wood. 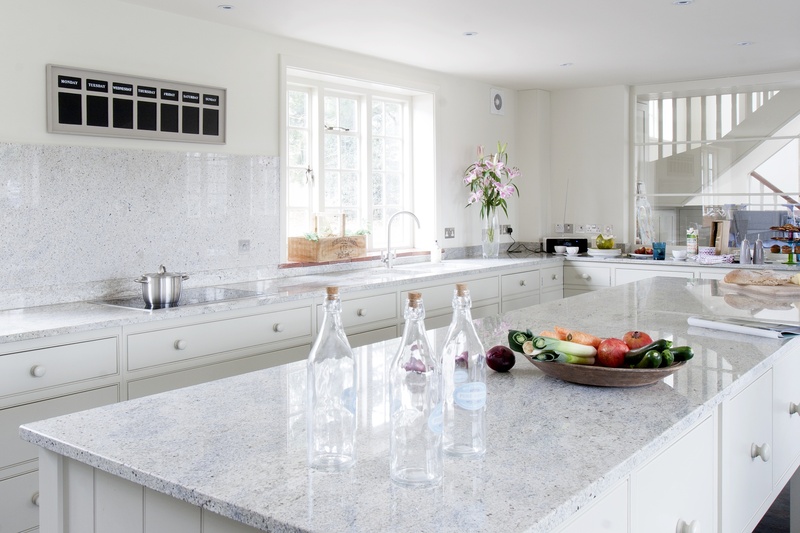 The classic Shaker-style kitchen is one of our most popular designs, due to its timeless yet distinctive aesthetic. 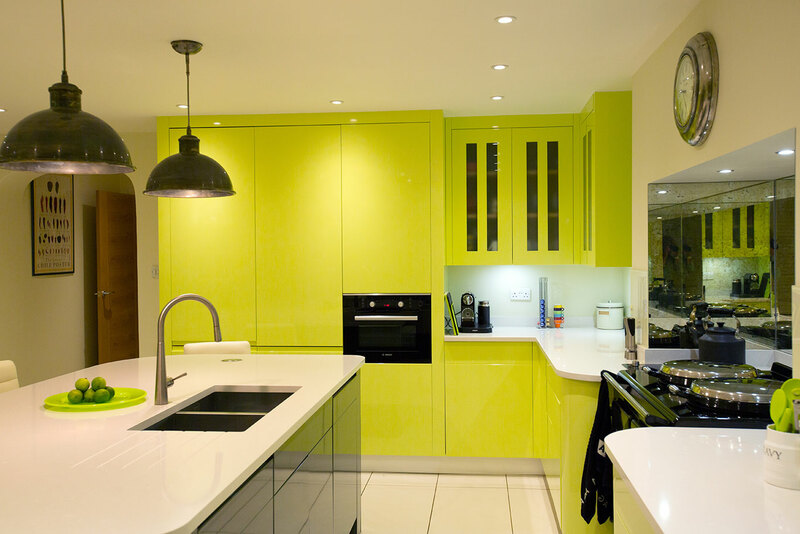 This style lends itself to any kitchen space, offering countless options in regards to layout, cabinetry, storage options and of course, colour. 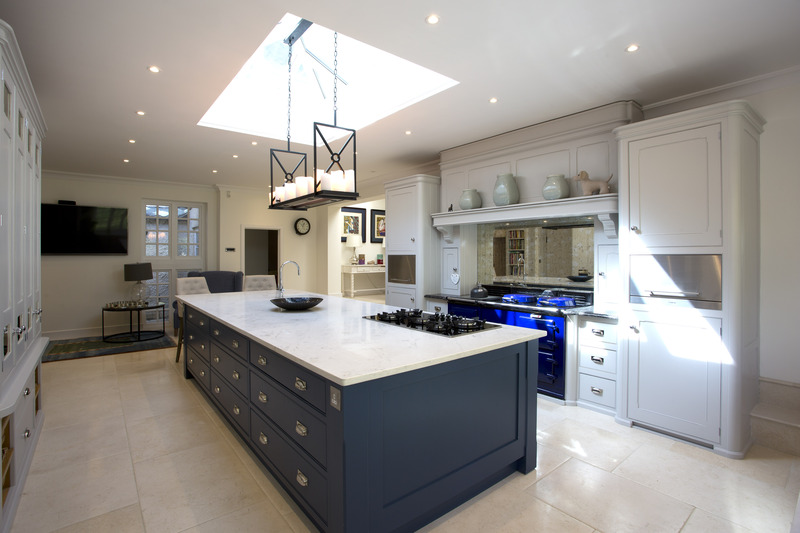 Single colour schemes remain an elegant choice, but more and more often we’re seeing clients choose two tone styles, like this beautiful River House kitchen. Embracing darker tones can give depth to your space, whilst adding a modern and on-trend twist. 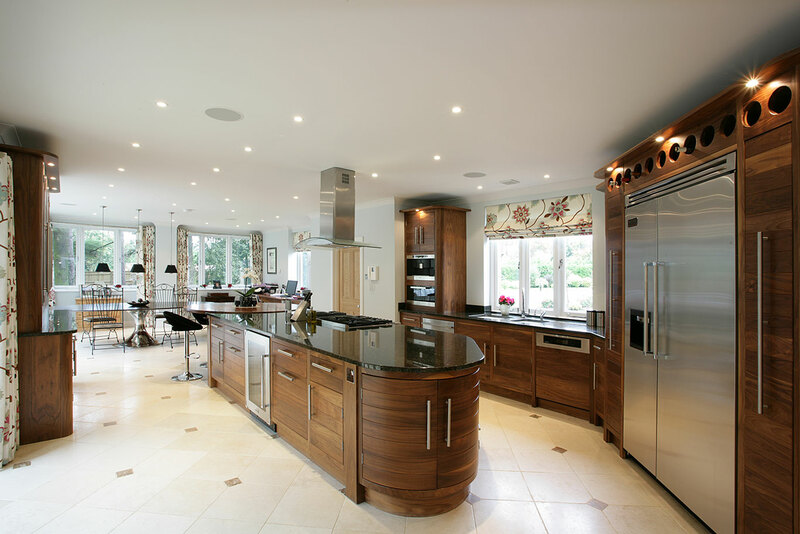 This luxurious, modern walnut kitchen in Bix, Oxfordshire was a joy to design and build. 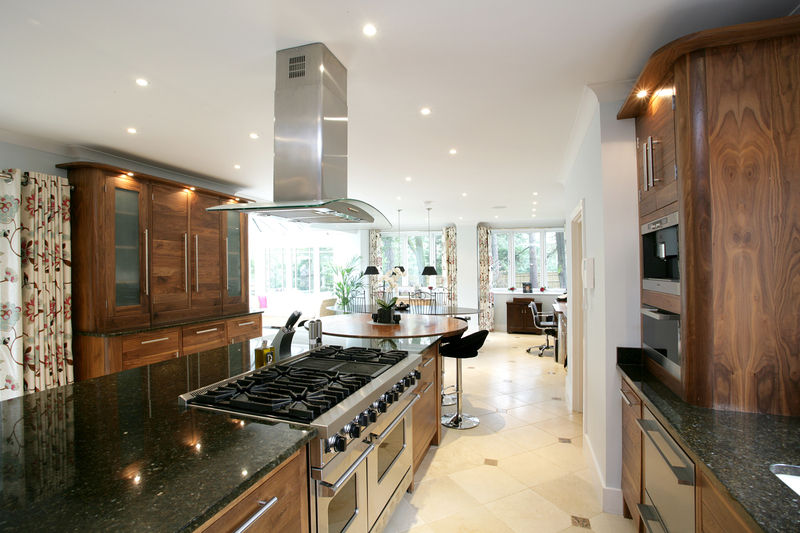 Embracing the warmth, richness and opulence of walnut, our client’s kitchen was designed to make an impact. 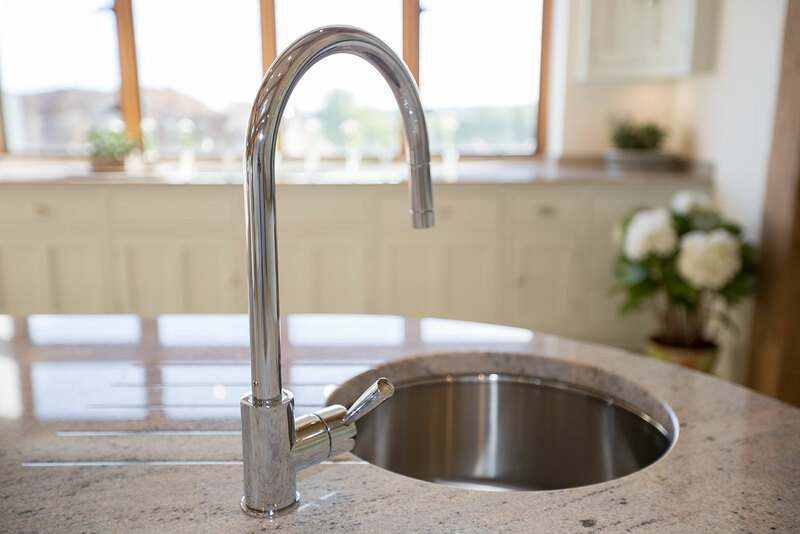 The contemporary aesthetic with smooth, curved edges was particularly well suited to the modern finishing touches of stainless steel and rich granite. 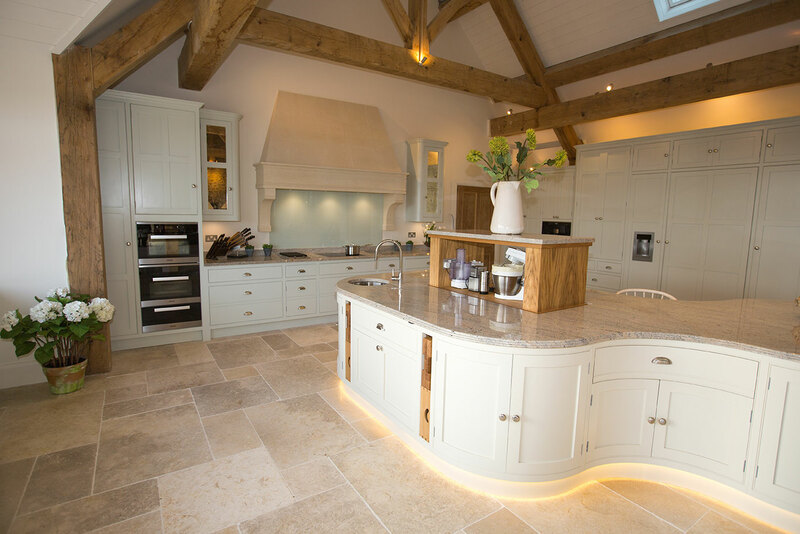 If you are looking to design your own bespoke kitchen and would like some further information, John & the team would be delighted to help. Please get in touch via our Contact Page.